The "Womb Blessing" is the best way to celebrate your pregnancy in Dubai. Women are amazing. We love, we care, we nurture. And when one of our own is approaching such an exciting, emotional time of her life - the transition from woman to mother - we naturally want to celebrate, to commemorate, to share the experience with her. The ancient ritual of a Mum and Birth Blessing is a wonderfully traditional way to give a mum-to-be an unforgettable experience as she nears the end of her pregnancy. The Mum and Birth Blessing is a traditional rite of passage that has been passed down from generation to generation of women in many ancient civilizations. 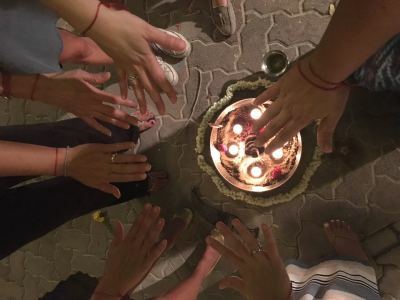 The blessing ceremony aims to encourage the mum-to-be, empower her and create the support network she’ll need in the first few days and weeks after birth. It’s very much a festive celebration, too! At a Mum and Birth Blessing the mum-to-be is very much the centre of our attention and the partecipants will pamper and entartain her with different activities (please contact me to know more about the different array of possible activities). From my experience I find the best time to have a Mum and Birth Blessing is in the 36th week of pregnancy, although of course this can be adapted to suit the mum-to-be. Let me help you create a unique, traditional way of celebrating the amazing transition you’re about to go through. You’re an amazing woman, on your way to becoming an amazing mum - that’s a wonderful thing!